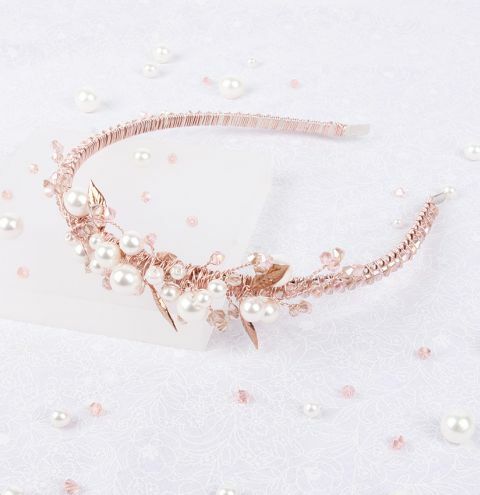 Create a delicate rose gold tiara using stunning glass pearls and crystals. This design is perfect for a Spring wedding or a party! champagne AB as you go. Keep going until you have enough beads to reach around the tiara base. Wrap the end of the wire around the tiara base to secure it. I wrapped approx. 7 times. Bring the first bead down the wire until it sits on top of the tiara base. Hold it in place and wrap the wire around the base 3-4 times. Repeat until you have covered the tiara base with a row of beads. Wrap approx. 7 times to secure the end and snip off the wire. Create a couple more crystal clusters, working with the long end of wire. Twist and wind these around the tiara base as you choose – it’s time to get creative! different lengths to make the beads sit where you choose on the tiara. Add a rose gold leaf here and there to give an organic feel to the design. If necessary, continue with a new piece of wire when you run out. Repeat the last couple of techniques, this time working from the opposite direction. wire and wrap ends securely into the design.